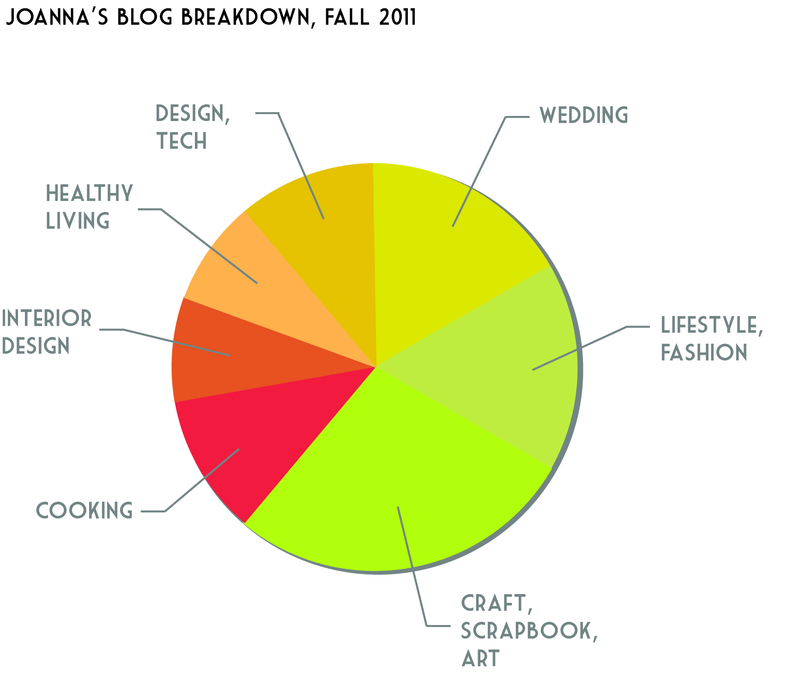 What started out as something only a small group of devoted quantified selfers cared about was the hot topic at CES 2013. Whether you want to call it quantified self, connected health, or wearable health – it’s a space to watch. I’m a quantified self enthusiast. I’ve owned two Fitbits, have been using some combination of paper, apps, and internet to track food and exercise for a few years now, and currently own the Jawbone UP. As I’ve watched the wearable health space explode in the last six months, I’ve been thinking a lot about what makes a good wearable health system. The way I see it, a wearable health system can be broken down into three parts: the device, the data, and the experience. In some ways, the device is very important – after all, it’s often the only part of the system that others can see. Perhaps because of this, the newest device designs seem to be trying to take a fashion-angle with their devices: the Fitbit Flex, Misfit Shine, and the new BodyMedia system will come in bright colors or with “jewelry-like” accessories. But what I think is more important than being fashion-forward is designing the devices for wearability. 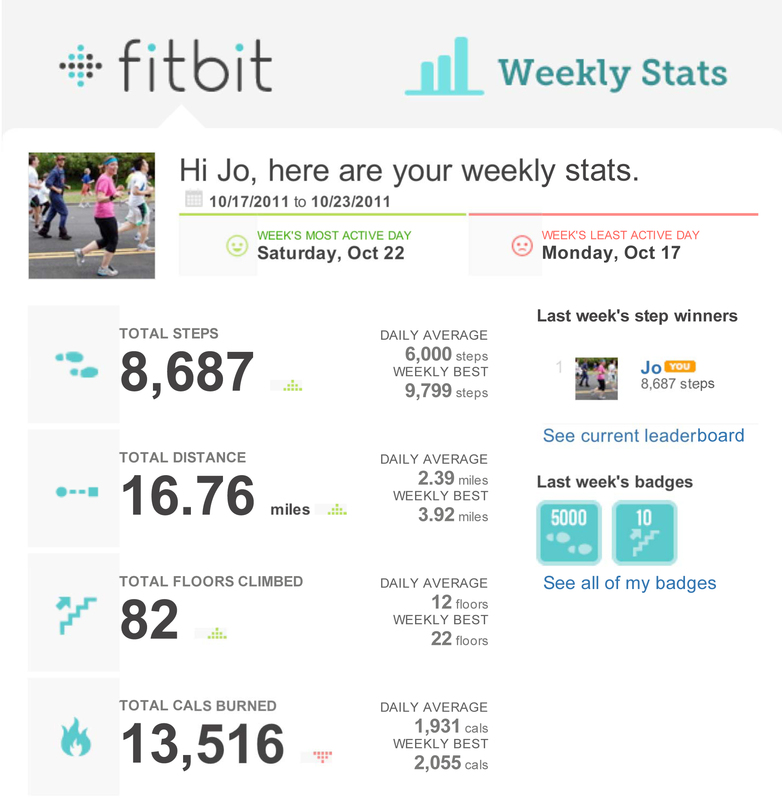 When I had the Fitbit Ultra, it annoyed me to no end that every time I changed from work clothes to workout gear, I had to remember to move my Fitbit, or lose credit during my most active times. My relationship with Fitbit ultimately ended when I lost my device for the second time simply walking around town. These days, I prefer the wristband style of the Jawbone UP and Nike FuelBand, because I can wear it all day without even thinking about it. Another key to wearability is how the device communicates with its wearer. UP has gone to one extreme by having no screen on it’s device – any communication to the wearer comes through vibrations. The Misfit Shine and FitBit Flex are somewhere in the middle – instead of showing specific stats, they use LEDs to give you an overall impression of your progress towards a goal. It remains to be seen if people will feel like they need on-device feedback, or if we’ll see screens and lights fading to the background. As important as the device is the data it collects. Nearly every new wearable health device has the ability to track multiple kinds of data (e.g., steps, stairs, sleep) over extended periods of time, and output graphs of it. But beyond clever graphics and comparisons (“you walked the equivalent of the Golden Gate bridge just now!”), I think the real magic is when the data is interpreted for you. Jawbone’s UP claims to have an ‘insight engine’ that “discover[s] hidden connections and patterns in your day-to-day activities.” My experience has been that some of these insights are indeed quite motivating; for example, this message last week helped motivate me to go on a run that afternoon. Others seem like they have little to do with my specific data set: this message about sugary drinks seemed particularly unhelpful given that I rarely drink sweetened beverages (and the UP should know that, since I use it to track food). UP’s system isn’t perfect, but I love the direction it is headed in, and I hope more wearable health players will incorporate targeted feedback into their offerings. In addition to providing more interpretation of data, wearable health makers will also need to address the fact that data gets stale. After wearing a device for a while, the data that was interesting to you when you started out is no longer valuable. By the time you’ve worn your device for a few months, you know what your average steps are (~6900), which days you walk a lot (Saturday and Sunday) and a little (Monday), and it’s no longer enough to see the same stats. To keep the data interesting, I suspect that wearable health makers will need to differentiate with the experience. To me, the experience – on the device, apps, and online – is probably the most important aspect of a wearable health system. When I say experience, I don’t necessarily mean the experience of using the device, or the data as a standalone, but the experience one has using the entire system for a length of time. (Interestingly, the current wearable health darling, Misfit Shine, says almost nothing about their online or app experience in their Indiegogo campaign). One thing that enables a great experience is integration, or allowing data to be brought in from or sent out to other trackers. Integration is key, because you can bet that the majority of people who are tracking steps and sleep are also interested in weight, calories, and other bits of data. Right now, Fitbit might be the winner for integration; it takes in weight data from the Withings scale, and plays nicely in both directions with activity apps like MapMyRun and food tracking apps like Lose It! But where Fitbit wins on integration, Nike wins on what I think is the second enabler of a great experience, gamification. With their new game platform, NikeFuel Missions, they’re going beyond badges and challenges and using traditional video game strategies – avatars, narratives, and levels – to motivate people to get active in real life. Nike recently released a video previewing the NikeFuel Missions, and while the details are still very much in the air, I’m excited to see where it goes. If the recent success of Zombies, Run!, the $8 app that tells an audio-based zombie fighting storyline as you run, is any indicator, gamification is going to be big in the future of wearable health. The wearable health space is huge right now, with new players coming to the market every day. As the space gets more crowded, I’ll be looking for the folks who can differentiate with device wearability, insight engines, and gamification. When I was living and working in San Francisco, I had the chance to do some fascinating research on life loggers, i.e., people who go to extremes tracking data on themselves. In the course of our research, we talked to one person who tracked all of her workouts and food intake on a notes file on her iPhone. We talked to another person who created elaborate excel spreadsheets for budgeting and goals tracking. Another woman we talked to kept ongoing scrapbooks of her life for 18 years, and had all of them together on a massive bookcase in her apartment. We learned that there is a whole movement, called Quantified Self, growing around this life-logging trend. I’ve always been interested in documenting my experiences and the things I learn, so what these folks were doing totally resonated with me, albeit on a lesser scale. I’m not necessarily interested in tracking everything about my life, but I have been experimenting with several tools, online and off, that aid with doing self-assessments of all kinds. So, behold, my quantified self. 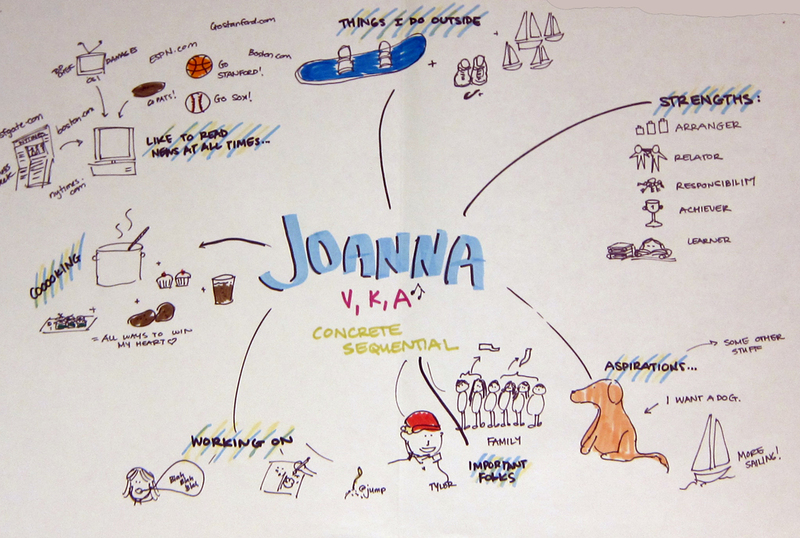 At Jump, every time we joined a new project team, we would create some variation of this mindmap. Basically, we told our teammates what our thinking styles and learning modes were, what strengths we had (from the Strengthfinder 2.0 test), what we were working on during the course of the project, and finally, what we had going on outside of work. We drew it up on sheets of paper so we could hang them in our project space as a visual reminder for each other. This is one of mine from several years ago (pre-Hinckley!). I’ve just finished reading What Color Is Your Parachute?, a great book for helping people figure out what next steps to take in their careers and how to effectively job search. 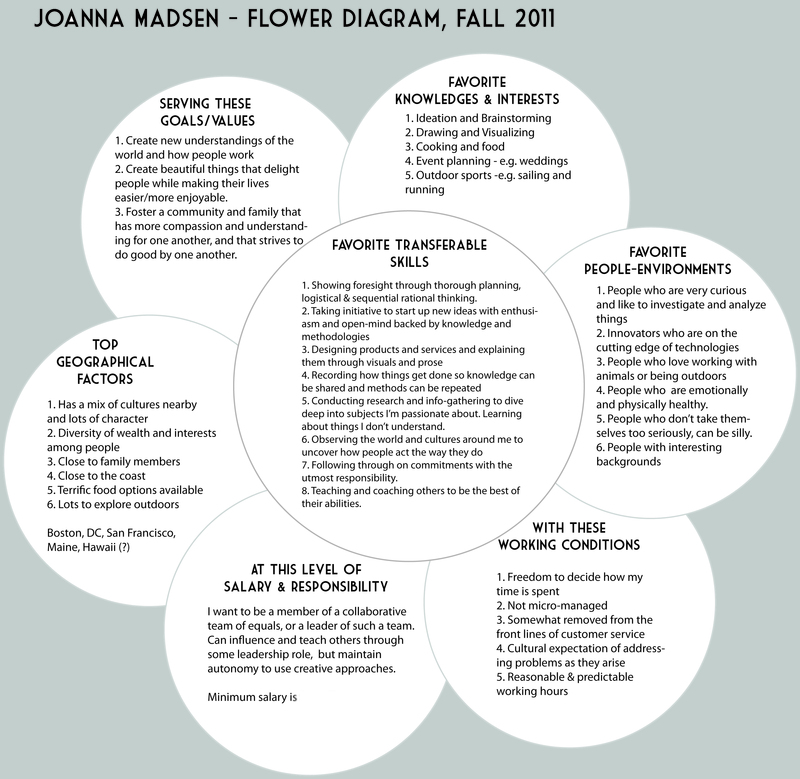 In chapter 13, you go through a rigorous self-assessment to identify what matters to you in a job, on seven different petals. Even though I’m not considering a big career switch at this stage, I found this exercise helpful in reminding me both what I’m best at and what I enjoy most. Klout.com is a free service that measures your influence by pulling in data from Facebook, LinkedIn, Twitter, and other social networks. I like to think of it as Google Analytics, but for your personal brand. Klout creates a score between 1 and 100 based on how many people you influence, how much you influence them, and the influence of your network. It’s in beta right now, but seems to be gaining popularity. I’ve talked about Fitbit already, but one of the neat features of Fitbit is that it’s not just a pedometer that you look at during the day to see how many more steps you need to take. Fitbit has an online dashboard that shows you step progress over days, weeks, or months, and also can track food intake, sleep habits, etc. It’s a lot like Mint.com but for health. Conveniently, it sends you weekly updates in email form in case you forget to go to the website. 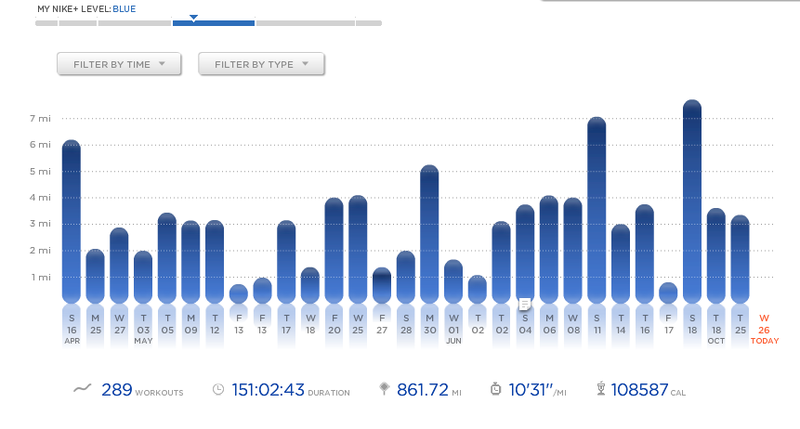 I have loved using nike+ for many years to track my running, and in my opinion, it’s still the easiest service out there for tracking, sharing, and feeling motivated. Another good site for exercise tracking is Daily Mile, which allows you to add all types of workouts, from yoga to running to swimming. 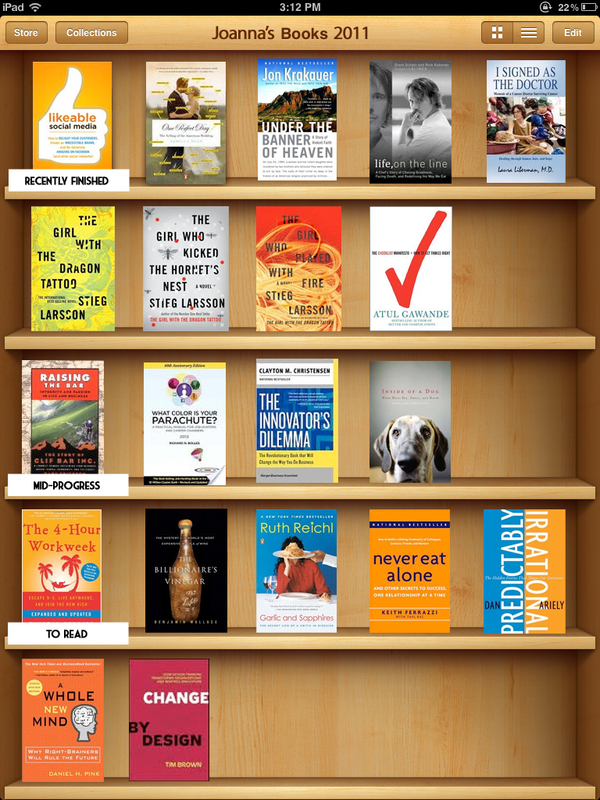 A visual of what I’ve been reading lately. I’ve found that Goodreads is also a great place to track reading and share book recommendations with friends. I follow about forty blogs in my Google Reader. Here’s how they breakdown. Breakdown of what we watch – good thing we have Tivo! Well there you have it. My quantified self. What are your favorite tools for life-logging?